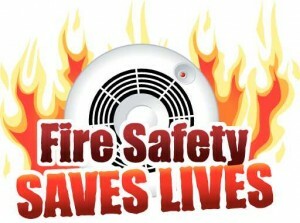 Most fires are totally preventable by following basic precautions and some common sense. Here we look at some ways you inspect your home to identify anything that could be a fire hazard. This will allow you to take the necessary steps to keep your property and loved ones safe. Local fire service members will visit your home at a convenient time and carry out an inspection of your property. Don’t be alarmed if a fire engine arrives at your home, as the visits can sometimes be carried out by operational firefighters. The visit could also be carried out by a dedicated safety team. Such visits are free of charge and you might even be eligible for free smoke alarms and fitting. The visit is friendly and unobtrusive, with safety advisors chatting with you about any fire safety issues identified such as electrical safety, the use of electric equipment and smoking for example. Each room will be inspected to identify things like overloaded plug sockets or wire problems. It’s a great opportunity for you to ask any questions and have an escape plan discussed. Fire risk assessments are also available for business premises and workplaces. For more information on your obligations as an employer with regards to fire safety, consider a Gloucestershire Fire Risk Consultancy and Visit Keloscape. For those worried about elderly relatives, part of the visit can include health and wellbeing questions that will throw up any indicators that further help and support from different services might be beneficial. These home visits are easy to book through your local fire service and are regularly advertised through local media channels. Any member of the fire service who visits your home will come with full identification. If you cannot see their identification, then contact your local fire service to check they are genuine. You will never be sold anything during a home visit and the visit is completely free of charge, so beware bogus callers who offer such a service for a fee.